We’re finally in the thick of the holiday season, and it’s a good bet that you’ve got at least a couple holiday events on your calendar. As with most holiday events, there’s likely to be an assortment of food—from cookie exchanges to dinner parties to canapés and cocktails. Holiday celebrations seem to revolve around food. That doesn’t mean that all your hard-won weight loss efforts have to go the way of last year’s leftovers. 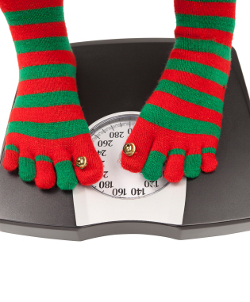 Here are 5 tips to help you beat the holiday weight gain. Skipping meals or regular eating times in favor of eating at the shindig is a recipe for sure disaster. You’ll likely overeat at the party, and all that bad-for-you party food won’t do your weight loss plan any good. The best thing to do is to simply eat when you normally would. If the party involves a meal, then have one serving and call it quits. If it’s more of a finger-food affair, one plate or one layer of canapés will be enough to not blow your waistline and not offend your host. 2. Go easy at the bar. 3. Focus on the party. Just because you can’t have a holiday party without food doesn’t mean you have to make the food your main reason for enjoying the party. Spend time chatting, mingling, dancing, and catching up with family members. Experts say that diverting your attention in other pleasant ways can keep you from overindulging. 4. Be the skinny cook. Avoid tasting everything as you prepare it. Let the kids lick the spoon, let Uncle Frank taste-test the gravy, and Aunt Margaret can tell you if the soup needs more salt. Find healthier alternatives to your family’s favorites. Try steamed green beans instead of mushroom soup casserole. How about baked latkes in place of fried? And what about fruit, nuts, and low-sugar, low-fat sweets to treat to your entire family’s waistline? 5. Walk it off or play it away. Suggest an after-dinner stroll through the neighborhood to admire the neighbor’s holiday decorations. Perhaps a good snow ball fight, ice skating party, or building a snow man with the kids? If you’re at a party, get your groove on and dance the night away. Savor the early morning stillness of winter mornings with a brisk walk or jog. Find special ways to enjoy the season that get you moving. There’s no need to ban everything but carrot and celery sticks during the holidays. With a little planning and a lot of common sense, you can have your cake (and cookies and canapés) and keep your waistline, too. ← What Are Fat Cells?